On a daily basis, the news headlines constantly remind us that our freedoms as American citizens are being defended vigorously. We owe much to the members of our armed services for their courage and making the ultimate sacrifice. Our country tries to support our veterans through retirement funds, medical services, and other obligatory governmental compensations; however, these alone are not enough. The backing that most often seems to fall short—and which our brave soldiers probably thirst for the most—is the feeling that we, as a nation, honor them. South Walton resident Forrest Taylor recently approached VIE to share something with our readers that means so much to him. As a World War II Army veteran, Forrest was invited to participate in the non-profit Emerald Coast Honor Flight, a member of the larger organization, Honor Flight Network, founded solely to help our WWII veterans realize their dream of visiting the National World War II Memorial in Washington, D.C., which was erected in their honor. The non-profit Emerald Coast Honor Flight flies our heroes and their guardians from Escambia, Santa Rosa, Okaloosa, Walton, Washington, and Holmes Counties to Washington, D.C., for a one-day visit to reflect at their memorial—all free of charge to the veterans. Based on statistics from a 2008 study, our nation is losing WWII veterans at the rate of a thousand per day. Honor Flight will continue to take the steps necessary to ensure that terminally ill and senior veterans are given top priority to fulfill their dreams. We are truly honored that Forrest has chosen VIE as his platform to share the story—a diary entry to his family—of his heartfelt experience on that special day. This is a small way for us to say “thank you” to Forrest and to all the past and present members of our nation’s armed services for all they have done, and continue to do, for our country. At the Pensacola Regional Airport, as instructed, I met my sponsor, Ray Danielson (one sponsor was assigned to every three veterans). I received my boarding pass and name tag, then looked around the USO. From that area, the entire group went through security. The Marine Corps provided servicemen to help vets in wheelchairs. Our old eyes concentrated on their youthful physical stature and spotlessly pressed uniforms. Since I have a pacemaker, I cannot go through the metal detectors, so I stepped aside to be checked with a wand. Finally, I was cleared to go to the boarding area. A few minutes after 0700, US Airways Flight 730 pulled away from the gate. We were told about the first of many surprises we would experience that day. Our pilot informed us that, prior to takeoff, the plane would pause at the firehouse next to the control tower for pictures. I saw two fire trucks with their lights flashing—one ladder truck, its ladder raised above the plane, was draped with a large American flag while firemen stood at parade rest (a sign of respect). Finally, we were on our way to the nation’s capital. About an hour into the flight, Cinnamon Holderman, executive director of Emerald Coast Honor Flight, gave each of us a personalized envelope. This was surprise No. 2. My envelope contained handwritten letters from sixth graders E. Kennedy and T. Duben thanking me for my WWII service. As I read the letters, my tears started to flow. There was no way I could have stopped the tears, and I didn’t care who saw them. We were making our final approach into Reagan National Airport when voices began to call out: “There’s the Pentagon!” “The Washington Monument!” “Hey, there’s the Capitol!” Each site was called out until the plane was flying too low to see others. As we taxied to our gate, we were greeted with another surprise: police cars flashing their lights and fire trucks spraying our plane with water cannons to celebrate our arrival. (I learned that water cannons spray only the planes of dignitaries coming to Washington.) Ground crew carried American flags in each hand while large American flags adorned the baggage carts. As I walked down the ramp toward the waiting area, I heard the sound of applause. As I entered the waiting area, a woman’s voice called to me, “Forrest, welcome to Washington.” She saw my name tag. As we shook hands, she thanked me for my service. I noticed that hundreds of people had formed an aisle for the vets to pass through. As we walked, people on both sides reached out to shake our hands, and there was a constant chorus of “thank you for your service.” Whenever I made eye contact with someone, I thanked them for being there for us. I don’t know about the other vets, but by the time I reached the end of this reception tribute, my eyes were tearing. With so much affection for us in the room, there just wasn’t time to grasp what was happening. Looking at the faces in the crowd, I realized that most of them were not yet born when we boys were serving our country in the early 1940s. How does a common man, one without the writing skills of Lincoln or Churchill, explain this American spirit? Outside the terminal, about twenty of us waited to cross a busy multilane street. Security stopped the heavy traffic so that we could cross to board our buses. To our amazement, instead of irritated drivers impatiently sounding their horns, they waved as we safely crossed. Another tribute, wouldn’t you agree? At 1110, our buses arrived at the National World War II Memorial. The memorial is made up of a large circular pond with two fountains and pavilions at opposite sides. The two halves signify each of the two major theaters of the war: the Pacific and the Atlantic. Surrounding the pond is a large circular walkway at least twenty feet wide. At the outer edge of the walkway are fifty-six identical vertical monuments—rectangular blocks of granite approximately seventeen feet high and at least five feet wide. The pillars are inscribed with the names of the forty-eight states (the number of states at the time of World War II), seven federal territories and the District of Columbia across the top. One section at the outer edge of the walkway has a curved wall about fifty feet long and five feet high. Attached to the wall are four thousand gold stars, each about the size of a man’s closed fist. 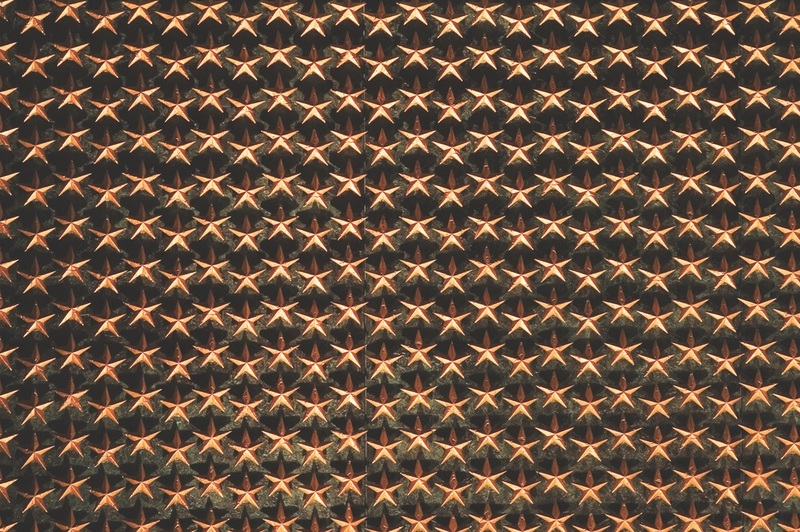 Each star represents a hundred soldiers who died in WWII—a total of four hundred thousand recorded dead. As we walked along the circular walkway, we met schoolteachers and their students who clapped loudly with their small hands and said to each of us, “Thank you for your service.” They handed us postcards, each with well-expressed thanks on one side and patriotic scenes they had colored on the other. 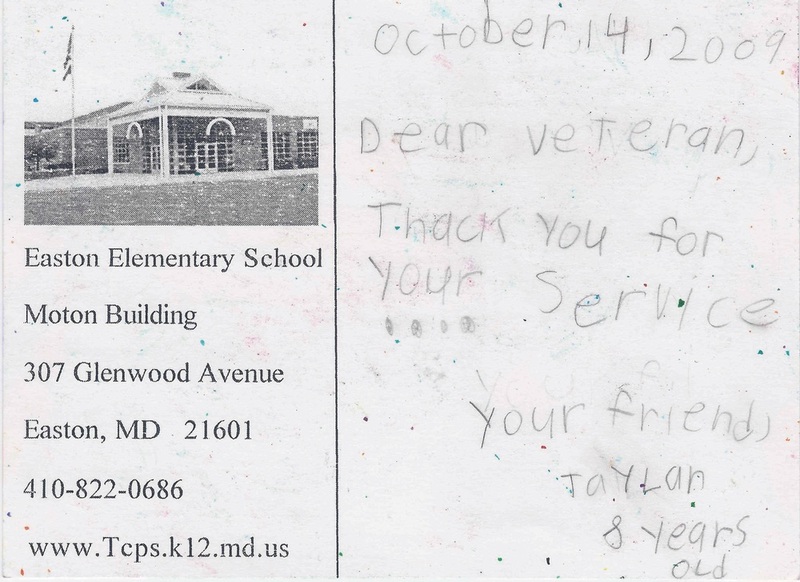 The three cards I received were from children who had traveled from an elementary school in Maryland. Vets posed before their states’ monuments for pictures. At approximately 1215, we walked a short distance to a large white tent with picnic benches underneath and received sack lunches provided by the Emerald Coast Honor Flight group. Near the end of our lunch, former Senator Bob Dole appeared as a special guest and greeted our group. The throng of press and veterans finally left the senator, and I seized the opportunity to speak with Senator Dole alone. A few minutes later, several classes of schoolchildren and their teachers sang songs for us. It was wonderful to see the intensity of both teachers and students who provided us with a first-class performance. At 1330, the buses took us to a parking area where we could easily walk to the Korean War Veterans Memorial, the Vietnam Veterans Memorial, or the Lincoln Memorial. There were fewer visitors at the Korean and Vietnam memorial sites, but the WWII and Lincoln memorials were very well attended. The Korean War Veterans Memorial interested me because I was in a rifle squad. The memorial shows a rifle squad in full gear, spread out in an advance formation. Although I was pleased to see this memorial, it did not have the emotional impact of the WWII Memorial. While walking to the Vietnam Veterans Memorial, I noticed that many vets from our flight were not at either the Korean or Vietnam memorials. Looking toward a shaded area with benches, I found them enjoying a rest. The last time I saw the Vietnam Veterans Memorial, the base was filled with mementos left by veterans, families, friends, and children. 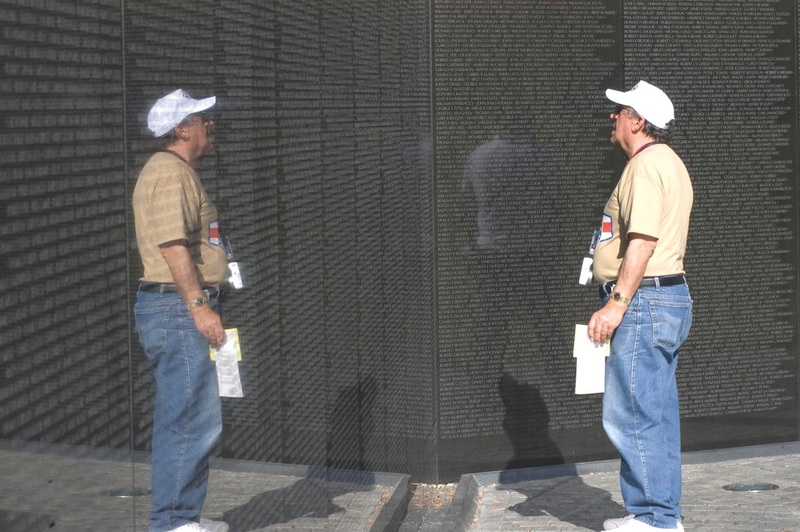 While noting the size of the wall holding fifty-five thousand names, I realized that the WWII Memorial wall, covered with four thousand gold stars, would have to be seven-and-a-half times the length of the Vietnam Veterans Memorial to cite all four hundred thousand names. I told my sponsor, Ray Danielson, that I would like to visit the Lincoln Memorial. I looked up at the Acropolis-style structure with massive stately columns atop a hill—a most impressive sight. Leading to the interior (where the sitting statue of Lincoln is placed) are three levels of steps. I had been seriously ill during the first two weeks of September, so I was thrilled to be the only vet of the 103 in our group to ascend all the steps. When I finished photographing the memorial, I walked in front of the statue to see whether Lincoln’s eyes really do follow a person. I think they do. I had time to sit on the topmost step, look across the Mall, and see a bit of the Capitol peeking out to the left of the Washington Monument. This misalignment was the result of unstable ground, which required the monument’s foundation to be moved to the right of a perfect sight line. Before the WWII Memorial was built, many people feared that it would interfere with this sight line. From where I stood at the top of Lincoln Memorial steps, the WWII Memorial appeared to be below the sight line. It would have been desirable to sit there longer, quietly reading or enjoying the view as many others were doing; however, it was time to board a bus for our next stop. 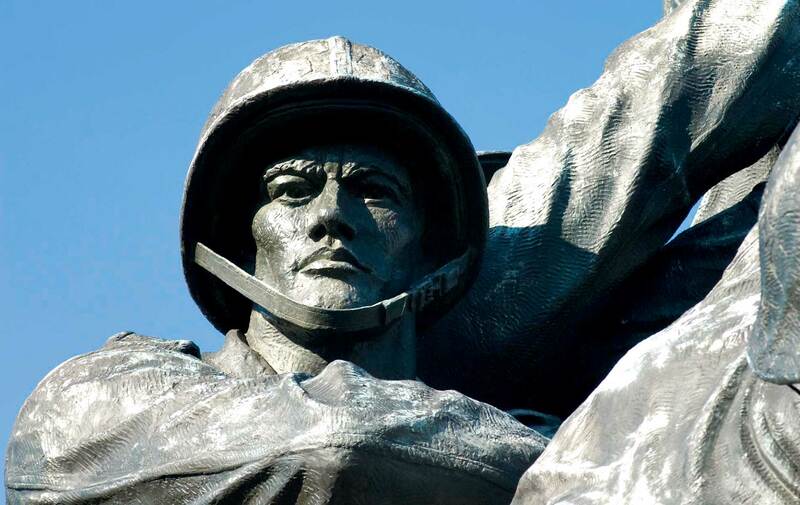 At the Iwo Jima Memorial, the soldier flag raisers appear lifelike and are placed well above head level to give the impression that they are on Mount Suribachi. 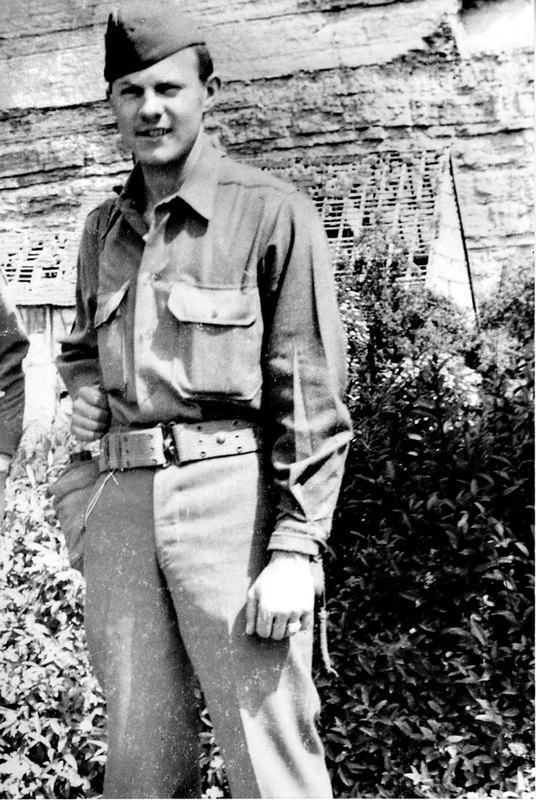 Author James Bradley, who wrote the book Flags of Our Fathers, is the son of one of the original flag raisers. Our group assembled for a group photograph in front of the monument. Then we boarded our buses to return to Reagan National for our return flight to Pensacola. At Reagan, we did not have to go through security but went directly to the departure gate, showed our name tags and driver’s licenses to the gate attendants, and boarded. I noticed many more conversations among the vets than there had been on the flight to Washington. After our in-flight dinner, the activities of the fulfilling day took a toll on the bodies of the men. We arrived at Pensacola at about 1930 and deplaned. We assembled in the waiting area where there were wheelchairs to carry those vets whose legs could not hold up for the long walk to the exit. The corridor was lined on both sides with an Honor Guard, standing in front of hundreds of people who were shouting, clapping, and waving American flags. Similar to the crowds at Reagan National, the people at Pensacola reached out to shake our hands and thank us for our service. This was a time for jubilation, and there were no tears during this stirring celebration. It had been a day that the 103 of us could never have envisioned back in the early 1940s when we were young men. Back in Room 439 at the Hampton Inn, I realized that I was somewhat tired. Without taking time to examine the gifts, I prepared for bed. Before going to sleep, I took the time to ponder what a wonderful life I have had and to feel blessed to have lived to the age of eighty-seven. First, it was our parents and families. In many Depression homes, that included grandparents who gave us the values of love, honor, and obedience. Not only were there usually three generations under one roof, but generally two languages were spoken since grandparents from Italy, Greece, Germany, and the Balkans were usually first-generation Americans. 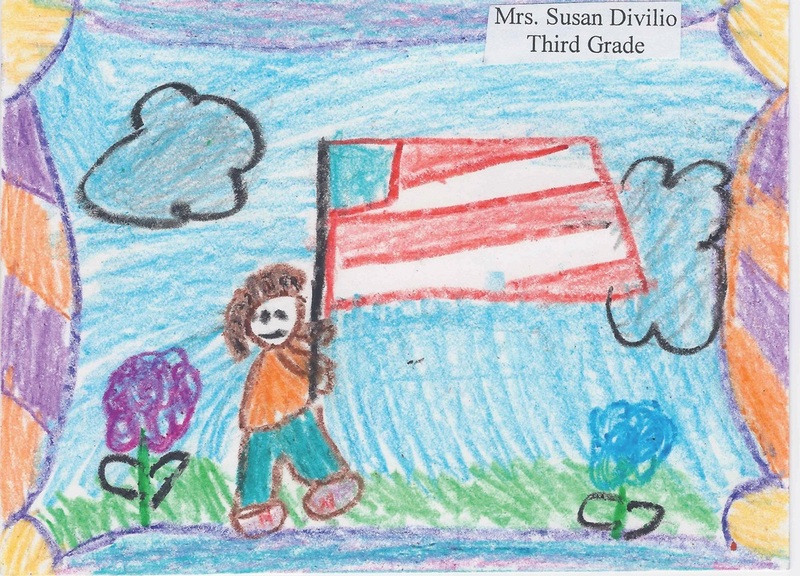 Second, a silent army of hundreds of thousands of teachers taught us citizenship values that citizen soldiers need. Lastly, it was the churches and synagogues that gave us religious support. For more information about Honor Flight, please visit the Emerald Coast Honor Flight website, www.EmeraldCoastHonorFlight.com, or the Honor Flight Network website, www.honorflight.org.